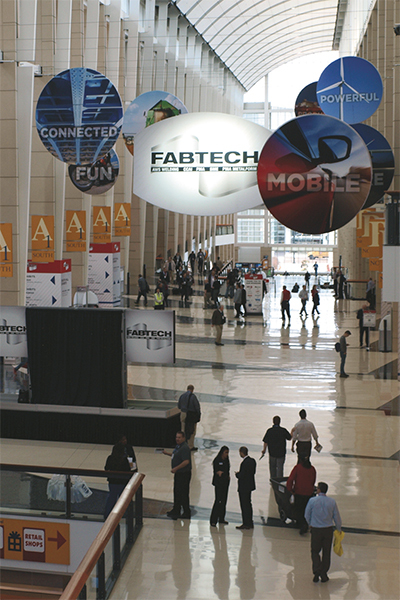 Celebrating manufacturing’s strength and innovation, FABTECH 2015, held in Chicago this past November, boasted 43,836 attendees from more than 90 countries visiting 1700-plus exhibitors in more than 730,000 sq. ft. of space. These record-setting numbers cemented FABTECH 2015 as North America’s largest collaboration of technology, equipment and knowledge in the metalforming, fabricating, welding and finishing industries. MetalForming surveyed the aisles at FABTECH looking for technologies and products to help metalformers and fabricators succeed. We present some of these below, and we’ll present more in future issues. The MiniBendCenter on display at the RAS booth seemed perfectly outfitted for folding small, complex parts. As the tools of the upper and lower beam clamp the workpiece, an arcing movement of the upper or lower folding beam bends the part to the programmed angle. The machine takes on blanks as small as 1.5 by 2 in., and as large as 23.6 in. square, with maximum thickness of 11-gauge mild steel. Blanks are automatically loaded, squared, measured and folded. A manipulator moves and rotates the parts from folding station to folding station (one setup could have multiple stations). The machine checks the exact position of the blank in the manipulator when starting the folding sequence—no gauges or mechanical stops are used, leading to quick folding sequences, high throughput and short cycle times. The beauty of the robotic loading system: It uses a camera and scanner to automatically detect the location of the blanks in the bulk box, enabling the robot to reach into the box and pick up the top blank in the stack. RoboVent trumpeted eTell, a predictive control system for air-quality equipment that reportedly improves energy efficiency, prolongs filter life and reduces operational costs. The cloud-based program, which RoboVent claims to be the first of its kind in the industrial-filtration industry, uses advanced analytics to learn a plant’s processes and trends, and make automated adjustments to improve system performance. MetoKote Corp. highlighted new Powercron AdvantEdge electrocoating technology, engineered to provide improved protection of cut, stamped or formed edges on sheetmetal parts. The e-coat, made available through PPG Industries, reportedly offers several performance advantages over e-coats formulated with conventional metal-based catalyzing technologies. These include curing at temperatures as low as 320 F to reduce energy use and related carbon emissions, as well as good workability, smooth film appearance, enhanced throwpower and good corrosion resistance. The e-coat material, a cationic-epoxy product formulated with a proprietary metal-free catalyst that eliminates the need for dibutyl tin and other scarce or restricted heavy metals as catalyzing agents, proves ideal for commercial uses such as automotive parts and accessories, heavy-duty equipment, agricultural equipment and fasteners. Box on Demand caught the eye of attendees looking to economize shipping operations with its Compack 1.4, a scalable, small-footprint box-making platform. Multiple-box output, hundreds of preprogrammed box styles, and multiple feed inputs are standard on the platform. 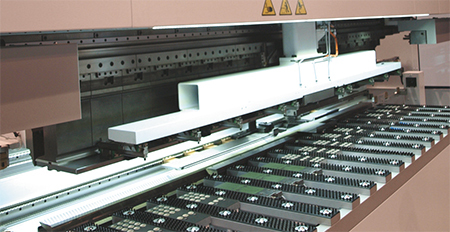 The system also features Panotec high-speed cutting-head technology designed for longevity and minimal maintenance. The technology is an ideal solution for companies looking to minimize shipping costs, especially those from excess dimensional-weight charges. By creating the right-sized box for each shipment, manufacturers can save on corrugated material, shipping costs, and void-fill expenses. Exact Metrology partnered at FABTECH with Perceptron, a provider of automated dimensional-inspection and gauging products using traditional industrial robots for inline and near-line applications. Perceptron showcased its new AutoScan Collaborative gauge that brings automated 3D scanning, dimensional measurement and dimensional gauging to the shop floor. AutoScan combines the latest Collaborative technology with Perceptron’s Helix Smart Scanning sensor technology in this product. The robotic system seen at FABTECH, which replaces hard gauges and handles a variety of parts, eliminates the need for traditional robot safety fences and can be programmed via manual guidance. Fully automated, the gauge offers high-speed inspection with no part preparation, sprays or stickers required, and can be operated by those without metrology expertise. The Helix 3D scanning sensor features robust industrial-grade construction along with programmable laser lines and scan volume. Vector software included in the unit provides real-time status monitoring, an extensive SPC reporting package, visual alignment, automated feature extraction and configuration via CAD files if needed. 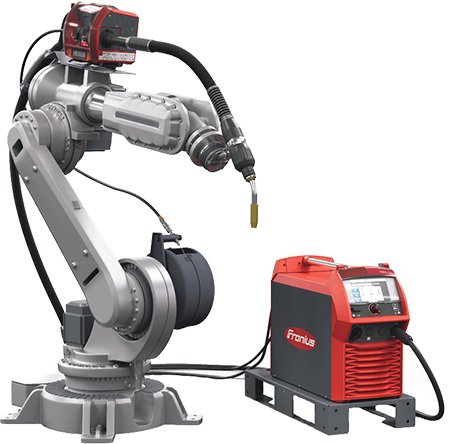 Fronius launched the Trans Process Solution Intelligent (TPS/i) power source, designed for rapid, repeatable robotic welding. Fronius engineers enhanced the Digital Revolution system architecture to cover and address all major influencing factors crucial to the welding process, and the addition of the new SpeedNet communication protocol reportedly doubles reaction speed and decreases processing time. In addition to constant-voltage and pulsed-GMAW, the modified dip transfer-arc LSC (low spatter control) and the modified pulsed-arc PMC (pulse multi-control) processes give robotic systems a significantly higher level of arc control, say company officials. 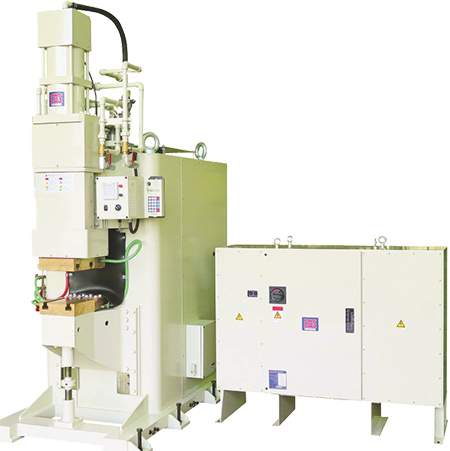 A penetration stabilizer ensures that penetration remains constant even during stickout fluctuations, by adjusting the dynamic wire feeder to maintain a consistent current value. An arc-length stabilizer keeps optimum arc geometry during changes in the weld-seam profile or weld-pool temperature. 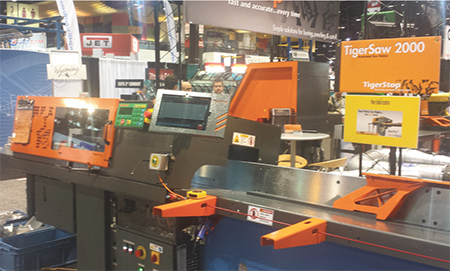 TigerStop unveiled its TigerSaw 2000, a fully automated cross-cutting saw with an adjustable cutting envelope, pneumatic clamping and a patent‐pending lube mister. The machine, designed specifically to handle nonferrous materials, pairs a 450-mm saw with an accurate, powerful pusher system that ensures finished‐part cut quality, and incorporates rapid, precise, automated lineal cutting software and crayon marking of defects. New features include an adjustable cutting envelope that accommodates saw-blade sizes from 350 to 500 mm, pneumatic clamping for handling delicate material, and a patent-pending lube-misting system that follows the blade and delivers lubrication at the cut point. 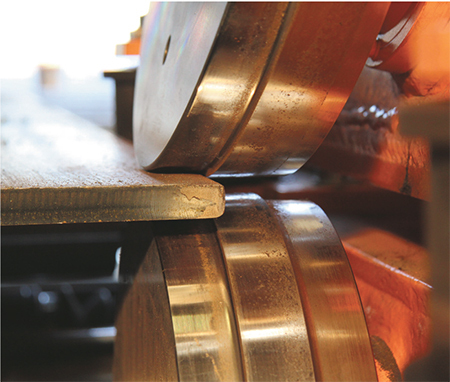 A new edge-rounding line from HGG Profiling Equipment delivers smooth, rounded surface edges to I/H-beams, tees and flat bars to prevent corrosion, while eliminating the labor-intensive costs of grinding. The line includes a conveyor for in-out material feed, aligning rollers to position and guide material, and an edge-rounding unit to stabilize and round the bottom and then top flanges. It also includes a handling conveyor for out-feed to a revolver that revolves material so that the top flanges can be rounded once bottom flanges have been rounded. Hypertherm Inc. used the FABTECH 2015 stage to introduce a waterjet-abrasive-management system that promises significantly lower waterjet operating costs. The system is comprised of two products: the PowerDredge abrasive-removal unit, available now, and the EcoSift abrasive-recycling unit, available in 2016. PowerDredge increases waterjet productivity and profitability by automating costly abrasive clean-outs, according to company officials, allowing companies to reduce labor costs and system downtime. EcoSift helps companies recycle their used abrasive. 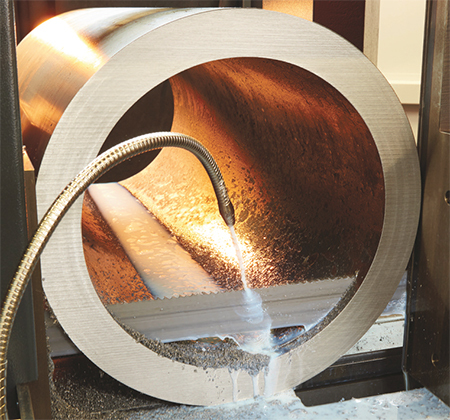 Testing and microscopic analysis reportedly shows that as much as 60 percent of abrasive sitting at the bottom of a waterjet table actually meets the specifications for new abrasive and can be reused without impacting cut quality. MJC Engineering, known for its CNC metal-spinning, rotary-forge and flow-forming machines, showcased its new hydraulic power system, Green Hydraulic Power. This system reportedly provides higher machine yield, reduces noise emissions by 20 dBA, generates less heat, produces a shorter cycle time on various machine types and involves less oil volume, all resulting in a system that saves as much as 70 percent in energy costs as compared to previous systems. Green Hydraulic Power is offered as a value-add on MJC’s Spectra Line of hydraulic power units provided on MJC machine builds and utilizes the Siemens Sinamics variable-speed servo pump drive. ATI Industrial Automation, Apex, NC, displayed its rail tool changers at FABTECH for rapid changeover of press transfer rails. The tool changers are engineered to withstand the high-speed, high-inertia loading environment that is typical with this process while providing the flexibility to automatically change end-effectors or other peripheral tooling. All ATI tool changers feature the company’s patented Fail-Safe locking mechanism and No-Touch locking technology. Sawing-technology specialist Kasto Maschinenbau GmbH & Co. debuted the KastoWin Tube A 5.0, specially designed for machining tubular material. With a saw feed rotated through 180 deg. and sawing performed upward from the support surface, the fully automatic machine works efficiently to reduce cutting-tool wear. It features a cutting range of 500 mm with a shortest possible cutting length of 10 mm. Using a frequency-controlled drive, cutting speed can be adjusted continuously between 12 and 150 m/min. Carbide saw bands of the type required for various tubular materials can be used without the need for any accessories. The saw band clamps in position hydraulically and is cleaned using a replaceable, electrically driven chip-removal brush. The vice and saw feed are equipped with zero-play linear guides, and ball-screw spindle drives ensure controlled cutting and material-feed movements. The SmartControl sawing-machine controller contains all material data and automatically sets all necessary parameters. Magswitch Technology, Inc., Lafayette, CO, launched several new products at FABTECH. Included was the MagDrill Disruptor 30, featuring the company’s shallow-field magnetic technology. 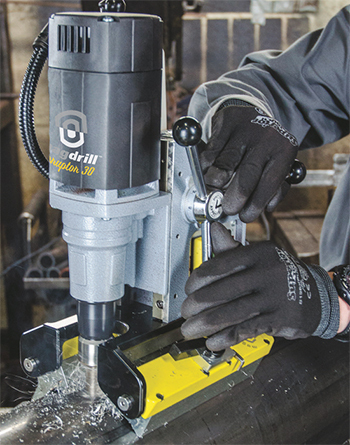 The first of a series, the MagDrill uses patent-pending pipe conformability, with its flexible drill base reportedly providing superior grip on flat and round surfaces via a pivoting magnet-base design. The lightweight tool requires no electricity and provides a controlled, powerful hold on range of steels—flat or curved. The progressive actuation of the magnetic force provides precise positioning before applying the full-magnet hold. Importantly, according to company officials, the magnet turns completely off and does not accumulate magnetic material from the drill site. 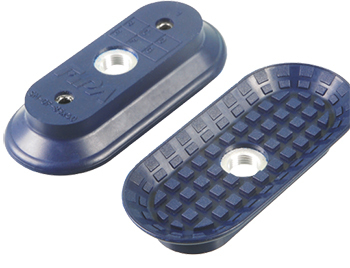 For increased safety, the locking feature of the base prevents magnet arrays from deactivating during use, thus ensuring safer tool operation. Dengensha America demonstrated its new Flexwave resistance-weld machine, with flexible waveform technology, at FABTECH. 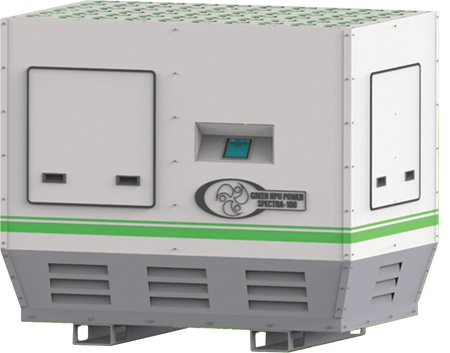 The machine combines the capabilities of a capacitive-discharge welder (CDW) and a 15,000-Hz bipolar medium-frequency converter (MFC) to offer enhanced control of energy release. We saw firsthand how the technology controls heat input and optimizes weld-nugget quality on steel and aluminum, as well as dissimilar materials, with weld parameters that are simple to set. And, the technology maximizes waveform flexibility, allowing fine-tuning of tempering, demagnetization, upslope, etc. The new Flexwave Welder Series includes the NICP-050, NICP-100, and NICP-150 models, with maximum weld currents of 50,000, 100,000 and 150,000 A respectively. 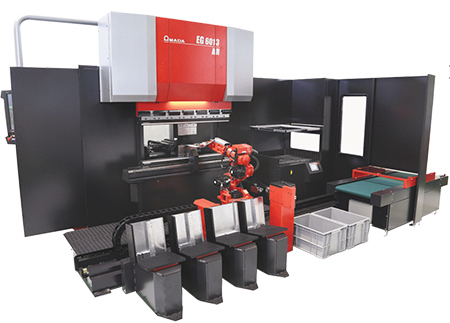 Amada raised the curtain on its new EG 6013 AR automated robotic-bending cell, combining a servo-electric press brake with an advanced bending robot. Recommended for high-speed forming of small, complex parts, Amada showed off cell features such as automatic angle measuring, offline programming, multiple part-load/unload stations and an automatic tool changer. Its six-axis robot travels along the ground in front of the press brake. In addition to loading blanks into the brake and handling the workpiece throughout the bending process, the robot can stack completed parts, or place them in boxes or on a synchronized conveyor belt. The robot also can change bending tools and grippers, and can carry out process steps that cannot be achieved if the press brake is operated manually. For example, the mechanical grippers can be guided around the tools in the press brake’s working area in order to ensure optimum assistance during operation tracking. The Lincoln Electric Co. Cleveland, OH, had a major presence at FABTECH, with multiple booths and a variety of fabricating technology in use and on display. Included was the Flextec 350X welder with a multiple-process power source—offering arc characteristics for all wire, DC stick and DC gas-tungsten-arc processes − to deliver flexibility. Fully protected components and its light weight make it ideal for outdoor use and harsh environments, and the IP23-rated welder reportedly runs cool even in high-temperature settings. With a streamlined operator panel designed to minimize setup time and simplify process selection, the Flextec 350X is compatible with multiple wire-feeder types, including across-the-arc, analog, digital or Lincoln Electric’s CrossLinc wire feeders. CrossLinc technology uses a proprietary communication protocol to maintain voltage control at the feeder, while eliminating an extra cable. The result is greater safety, quality and productivity, according to company officials. Fipa Inc., Cary, NC, exhibited and demonstrated its lifting technology, including FipaLift tube lifters as well as oval suction cups for sheetmetal-handling applications. The manually guided FipaLift tube lifters allow a single person to safely lift, transport and precisely position as much as 640 lb. of sheetmetal in a short cycle time and with minimal physical exertion. The lifters can handle structured, smooth, oily, dry, nonmagnetic and hot metal sheets without the risk of dents, scratches or exposure to paint-impairing substances, according to company officials. These lifters eliminate laborious, accident-prone and economically inefficient manual-handling processes in harsh production environments—even for heavy or awkwardly shaped sheets that otherwise would require the combined efforts of two or more people or robotic lifting equipment. Trumpf’s new TruBend Center 5030 panel-bending machine, presented as the perfect complement to its TruBend press-brake product line, displayed its ability to produce positive and negative bends, folds and circular bends with a variety of radii, all while minimizing setup times and tooling costs. 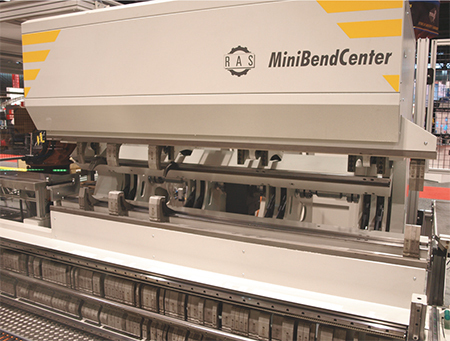 With a bending length of 10 ft., the TruBend Center 5030 is a thin-sheet processing specialist. Operators insert the workpiece material against the backgauge and the two-axis part manipulator performs all additional material handling required for bending steps along that edge; the bending tool moves to form each bend. The machine operator then turns the sheet and the process begins again. A unique design feature is the machine’s additional vertical axis for the part manipulator. Since the part manipulator can fix parts at a range of positions, this axis optimizes flexibility and provides for easy removal of parts with downward edges. With standard tools, the TruBend Center allows can form aluminum and mild-steel sheets to 0.120 in. thick and stainless-steel sheets to 0.090 in. Possibilities include short side lengths, deep boxes and small profiles, as well as parts with formed sections, recesses and diverse radii. The machine can also productively process galvanized and painted sheetmetal. To form parts with challenging geometries, such as very small profiles, formed sections near the bending line, flanges or staggered bends, additional blankholders and bending tools are available. The machine’s optical angle assistant ensures accuracy and proves particularly helpful when setting up new parts. 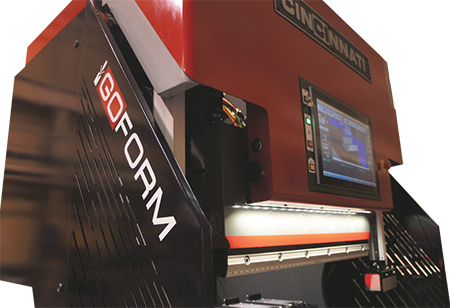 Cincinnati Inc. introduced its all-electric GoForm 40-ton press brake, ideal for small parts to 0.25 in. thick and weighing less than 50 lb. The brake features a 10-in. stroke, and with its 17-in. open height, can handle tall tools and adapters. A heavy-duty stress-relieved frame makes the machine ready for multi-shift operation, according to company officials, and is designed for full tonnage with minimal deflection. The drive system uses satellite roller-screw actuators that reduce heat and wear for heavy use and long life. A six-axis backgauge handles basic and complex part shapes. 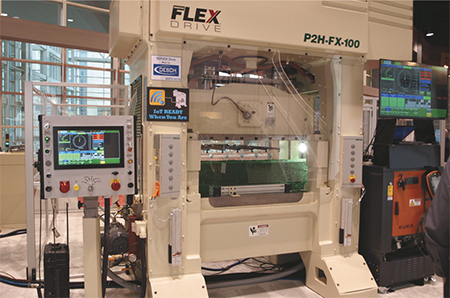 Nidec Minster introduced showgoers to its new P2H-FX Series servo-mechanical presses. The FX-100, a 100-ton model, was displayed at the show along with an integrated Kuka part-handling robot to demonstrate blank-feeding and part-removal capabilities. Designed for high-volume demanding applications, the P2H-FX series combines a traditional mechanically driven press with the flexibility of a servo drive. It features a one-piece cast-iron frame with low deflection characteristics, and is powered by a high-torque low-speed Siemens drive motor in a planetary gearbox arrangement. The setup offers a fully programmable slide-motion profile and a top speed of 250 strokes/min. See also: Amada North America, Inc, ATI Industrial Automation, Cincinnati Inc., Dengensha America Corp., Exact Metrology, Fronius USA LLC, HGG Profiling B.V., Hypertherm, Inc., Lincoln Electric Co., MetoKote Corporation, MJC Engineering & Technology, Inc., Nidec Minster Corporation, RAS Systems, LLC, RoboVent, TRUMPF Inc., Box on Demand, Tiger Stop LLC, Kasto Inc., Magswitch, Fipa Inc.